What Are DOC and POC? 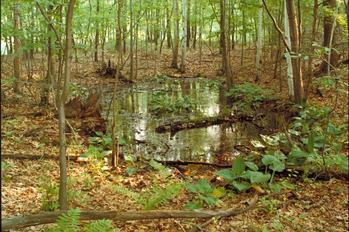 Wetland within Indiana Dunes National Lakeshore, Lake Michigan, Indiana. The brownish coloration is related to the high organic content of the lake water. Illinois- Indiana Sea Grant, photo by David Riecks and accessed via the EPA Great Lakes images website. Dissolved organic carbon (DOC) is defined as the organic matter that is able to pass through a filter (filters generally range in size between 0.7 and 0.22 um). Conversely, particulate organic carbon (POC) is that carbon that is too large and is filtered out of a sample. If you have ever seen a body of water that appears straw, tea, or brownish in color, it likely has a high organic carbon load. This color comes from the leaching of humic substances from plant and soil organic matter. This organic matter contributes acids to the stream, resulting in the yellow-brown coloration as well as weathering the soils. Organic carbon can be allochthonous, or sourced from outside the system (e.g. by atmospheric deposition or transported long distances via stream flow) or it can be autochthonous, or sourced from the immediate surroundings of the system (e.g. plant and microbial matter and sediments/soils within the catchment). 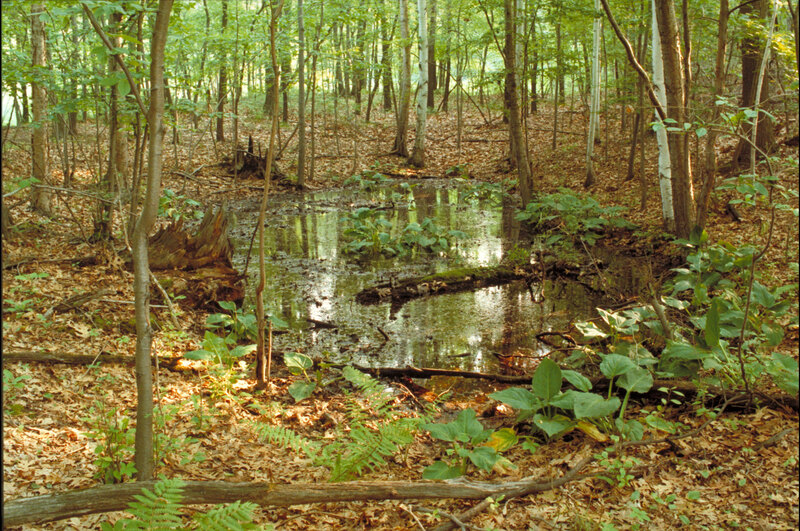 High amounts of organic matter are common in low oxygen areas, such as bogs and wetlands. Why Do We Care About DOC and POC? Dissolved and particulate organic carbon are important components in the carbon cycle and serve as a primary food sources for aquatic food webs. In addition, DOC alters aquatic ecosystem chemistries by contributing to acidification in low-alkalinity, weakly buffered, freshwater systems. Furthermore, DOC forms complexes with trace metals, creating water-soluble complexes which can be transported and taken up by organisms. Finally, organic carbon, as well as other dissolved and particulate matter, can affect light penetration in aquatic ecosystems, which is important for the ecosystem's phototrophs that need light to subsist. 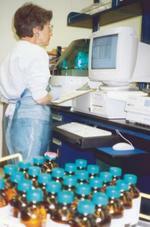 Dissolved organic carbon samples are analyzed on an ultraviolet persulfate total organic carbon analyzer. Image courtesy of the USGS National Water Quality Laboratory. The sample is collected in a glass container that has been baked in the laboratory at 550° C for 2-4 hours (the baking process removes any residual carbon in or on the collection vessel that may cause contamination). The sample is then filtered with a glass filtration device. Commonly used filters include glass fiber filters (GF/F), silver membrane filters, or a nitrocellulose/polypro filters and range between 0.7-0.25 um in pore size. The nitrocellulose/polypro filters are the least expensive of these filters, but may leach DOC, so they should be cleaned by passing deionized water through them before collection. Once collected, samples should be stored cold (e.g. in the refrigerator or on ice) until they can be processed. They should be processes as soon as possible to prevent post-filtering sample alteration. 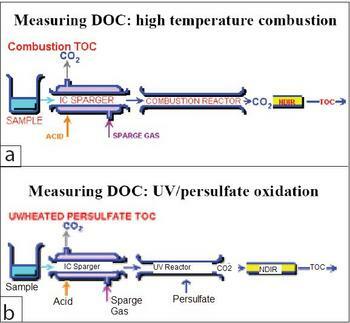 Total organic carbon can be analyzed using high temperature combustion (a) or UV/Persulfate oxidation (b). In each method, the sample is acidified to drive off inorganic carbon as CO2 and the remaining carbon is measured using an NDIR sensor. Image courtesy of Dr. Elizabeth Boyer. 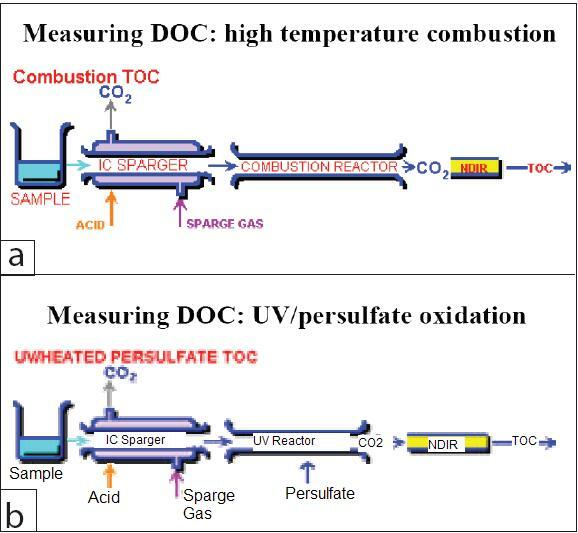 The high temperature combustion method for measuring DOC involves conversion of inorganic carbon to dissolved CO2, and purging this from the sample. The remaining (organic) carbon is then oxidized at a high temperature to CO2 which can be detected by the instrument's nondispersive infrared (NDIR) sensor and directly correlated to total organic carbon (TOC) content. This method combines the sample with an acid, lowering the sample pH to 2.0. This process converts inorganic carbon to dissolved CO2, which is then purged from the sample. A persulfate reagent is then added to the sample and the remaining carbon is oxidized by UV radiation to form CO2, which can be detected by the NDIR sensor and directly correlated to total organic carbon (TOC) content. Particulate organic carbon is measured by determining mass lost upon combustion of a sample. In aqueous samples, this can be done by measuring the dry mass of a filter that had a known amount of water passed through it before and after it is subjected to combustion via heating the filter to 550° C. This method requires that the filter is purged of extraneous POC before filtration (by combusting it at 550° C for 2 hours), and that the filter and sample are dry (this can be done by putting them in a warm oven) at their pre-combustion weight measurement. The method also requires that the sample has a measurable amount of organic carbon present. POC in soil samples can also be measured by mass loss by measuring the dry weight of a given volume of sample before and after combustion. 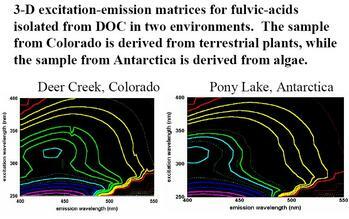 These methods assume that the mass loss is attributable solely to carbon, rather than any other sample component. In addition to measuring DOC concentrations in a sample, DOC can be characterized to determine its reactivity (including quality and composition), source, and potential importance in its ecosystem. Characterization via absorbance and fluorescence are discussed below. Terrestrial and microbial derived humic substances differ in their carbon to nitrogen ratio (C:N ratio). Terrestrially-derived humic acids have high C:N ratios because they are derived from lignin, and lignin does not contain nitrogen. These humics contain large amounts of carbon in the form of aromatic carbons and phenols. Microbially-derived humic substances have high N contents, relative to terrestrial sources, along with a low aromatic carbon and phenolic content. Utilizing these differences, UV absorbance can provide an estimate of the aromaticity of the DOC in a sample and thereby determine its source. 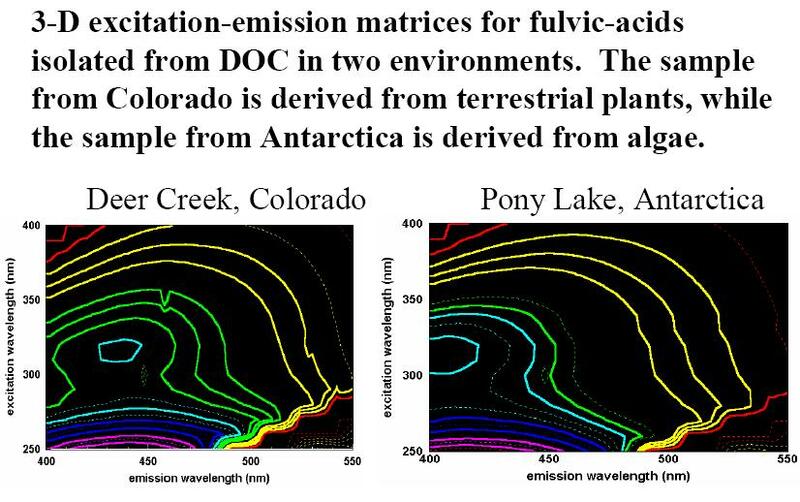 DOC can be characterized by differences in fluorescence spectra also, which is associated with different sources of organic carbon in aquatic systems. This method involves excitation of a sample and looking at its 3-d excitation-emission matrix for fulvic acids. Basically, a sample is excited and its corresponding emission intensity is used to determine its source. The emission intensity ratio is generally higher for microbially-derived fulvic acids than it is for terrestrially-derived acids. Fluorescence analysis of dissolved organic carbon can characterize the carbon source. Image courtesy of Dr. Elizabeth Boyer. As stated above, DOC is an important component in an ecosystem. It provides a primary food source for aquatic food webs, suggesting that high DOC is beneficial to an ecosystem. However, DOC can also contribute to the acidity of a water body and can increase light attenuation thus detrimentally affecting phototrophic organisms in an aquatic environment. Therefore, as with most things, moderation is key for DOC content. Depending on factors such as buffering capacity, or the ability of an aquatic system to stabilize its acidity/alkalinity, biomass composition and amount, and water depth, DOC necessary to support an ecosystem varies by area. Typical DOC values for various environments are commonly reported in scientific literature such as peer-reviewed journal articles and textbooks. Total Organic Carbon Measurement (DOC and POC) - a comprehensive guide to measuring organic carbon, including field sampling and analyses. This guide was written by Brian Schumaher, PhD., of the US EPA. USGS Water Resources - this site, by the USGS National Research Program, provides links to a variety of publications involving water quality and organic carbon analyses.